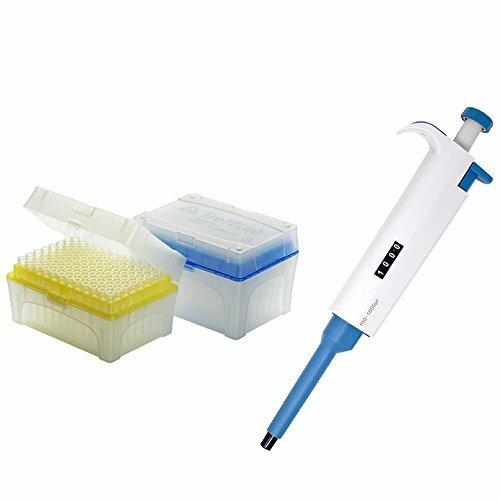 Our Starter, All-In-One Multi-Volume Adjustable Micropipette Kit offering great value for money! Low operation force. Smooth thumb pump action and smooth aspiration of various liquid. This pipettor is one of the most commonly used single-channel pipettes. It delivers performance with precision, all in a lightweight design that maximizes user comfort and reduces strain. The tip cone ensures low tip attachment and ejection forces. Integral tip ejector for access into narrow tubes. Easy to calibrate and maintain with the tool supplied. It's the ideal system for applications using expensive reagents and valuable samples. Click Add To Cart today to get this wonderful accessory for your science project. It makes for a great family or school gift, too. ✔ EASY TO USE - Digit display to allow for more accurate volume setting and easier volume identification. Low operation force. Smooth thumb pump action and smooth aspiration of various liquid. All in a lightweight design that maximizes user comfort and reduces strain. Easy to calibrate and maintain with the tool supplied. ✔ BONUS - Complete kit including 2 Racks of 96 Pipette Tips, User Manual, and Calibration tools. ✔ GUARANTEED QUALITY - All pipettes have been quality tested according to ISO8655/DIN12650. Each pipette supplied with individual test certificate. ✔ 100% MONEY BACK GUARANTEE - We want you to be 100% Satisfied with your purchase. Absolutely no risk. Give our product a try by ordering today. If you receive a defect product, we will send you the replacement immediately. Free of charge. If you have any questions about this product by Rs' Science, contact us by completing and submitting the form below. If you are looking for a specif part number, please include it with your message.